My friend, goddessmoments, had posted a photo on her FB page which showed what looked like an amazing restaurant that has just opened in Solaris Dutamas, Nathalie’s Gourmet Studio. We decided that we wanted to try it out and made plans to go today. They are open from 9 – 6pm, breakfast being baked goods and from 3pm onwards, tea and cakes. There was not a huge lunchtime crowd there (yet) but once people get to know the quality and level of cooking thats available, you will probably have to end up making reservations! Its a small place – about 6 – 8 tables, with seating outside that is not prime at the moment because of the construction going on next door. There is also a huge open plan kitchen where Nathalie runs cooking classes (AngelKitten and I are going for a macaron class soon!) as well as an organised professional kitchen which you can see from the seating area. When we arrived at 2pm, we were greeted and seated quickly. 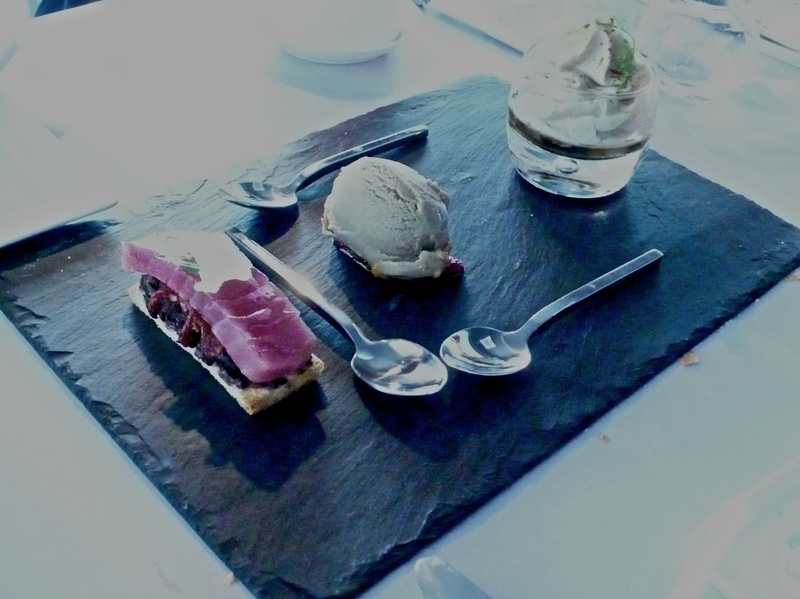 The menu is simple – 5 or so of each starters, main courses and desserts, as well as a small children’s menu. I love reading menus, and this one did not disappoint. You can see the mind of the chef working in the menu, and it was intriguing. 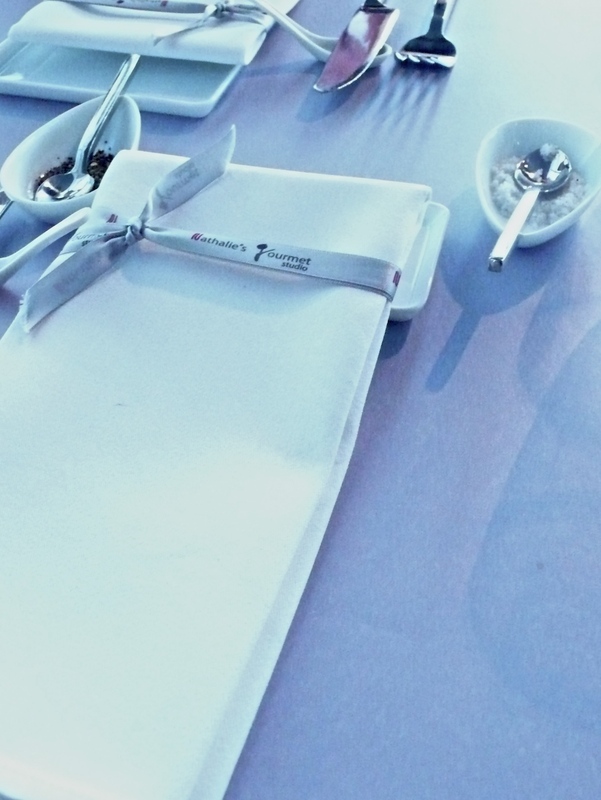 The place settings are beautiful and simple, yet elegant and functional. It made us feel welcome, and everything we needed was accessible immediately. 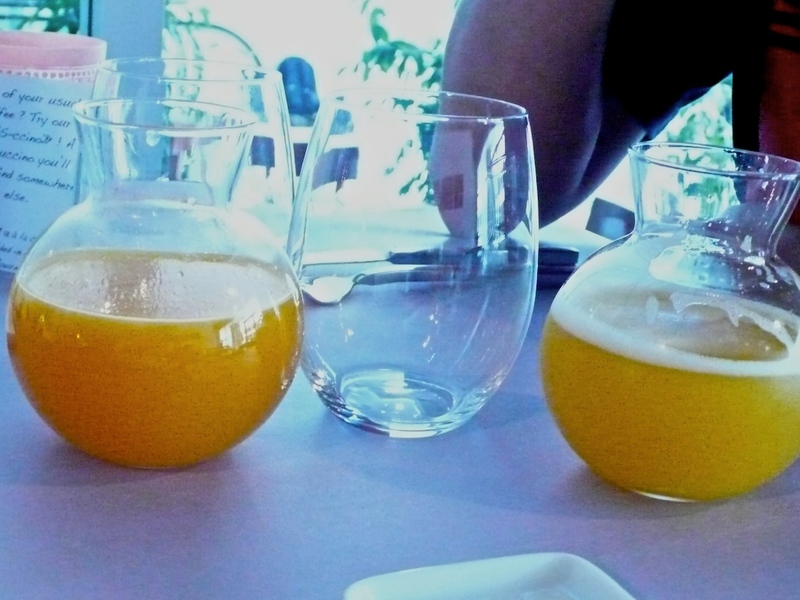 Nana and AngelKitten ordered juice, which came in beautiful little individual carafes. AngelKitten had orange (which I think may have been blood orange) and it was superb – the essence of orange, tart, sweet, sour, perfection. Nana had pineapple, which was sweet and gorgeous. I love the care and thought that has gone into the presentation here. It makes you feel special. 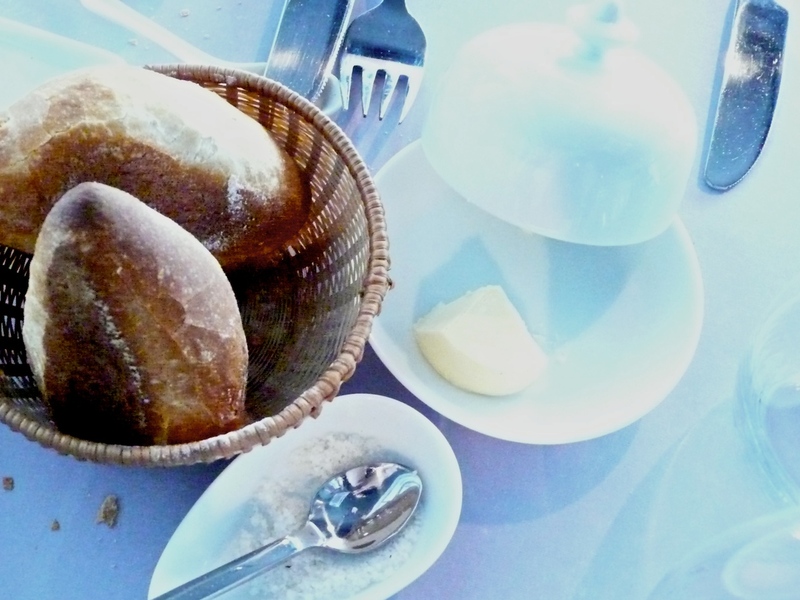 They served us gorgeous, crusty baked rolls, with sweet butter sprinkled with sea salt. I think you can tell the quality of a chef’s kitchen by their attention to details like the bread – and this one was perfect. I had a starter for my mains – the eggplant three ways. It was wonderful! First there was a little toast with savoury eggplant and raw tuna. Just an astonishingly lovely combination of flavour. Then there was an eggplant ice cream – savoury, cold, a hint of sweetness, silky on the tongue and wonderfully challenging for those of us who think of icecream as dessert. 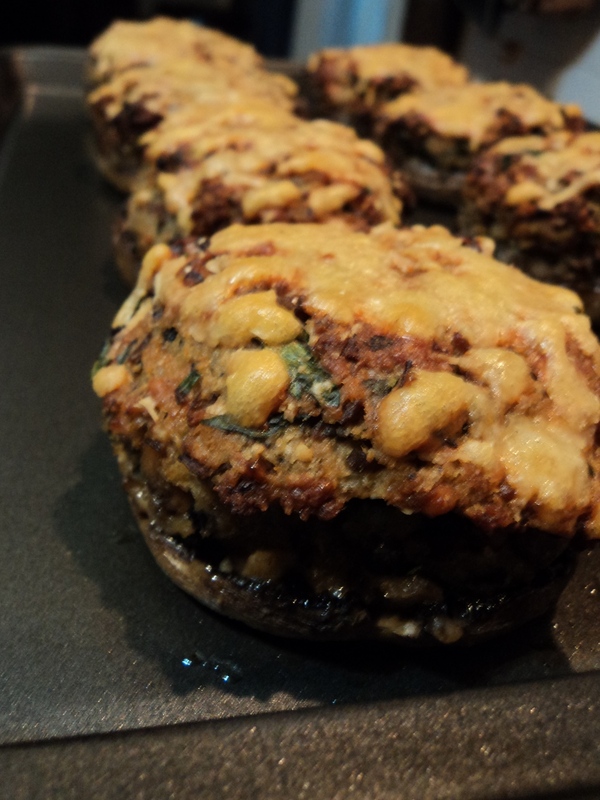 For me as a cook, it was a great exploration of seeing eggplant in a different way. And finally, there was a beautiful eggplant jelly, with an eggplant and cream espuma or foam. It was my favourite. The creamy dusky flavour was essence of eggplant, and made me think of making an eggplant soup that would have those flavours in it. Not only was this a mouthwatering dish, but it was visually stunning. Nana’s main course was the duck confit. He said it was delicious. 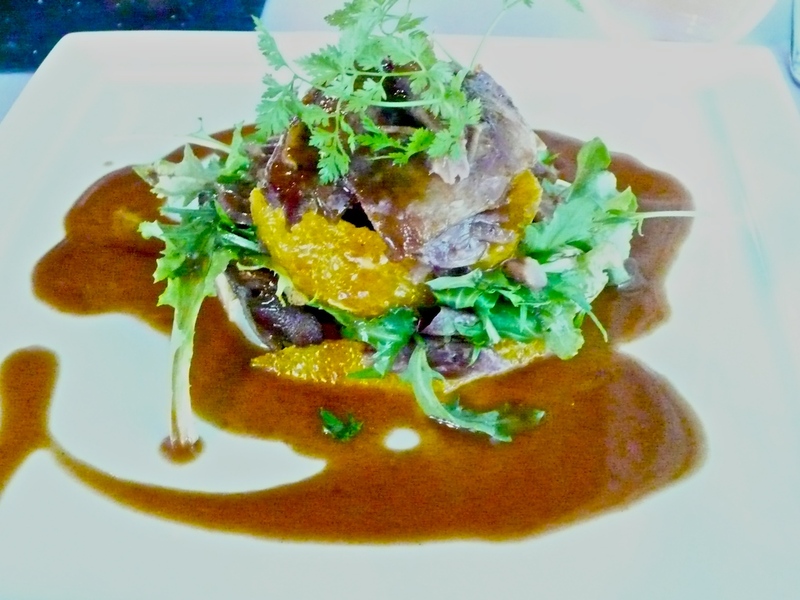 Beautifully cooked duck, orange, and caramelised onions. He loved the balance of flavours, and the satisfaction of a hearty meal that was presented absolutely beautifully. AngelKitten was looking for a simple main course so she could concentrate on dessert. She ordered from the children’s menu (since she is 12 plus 8!) 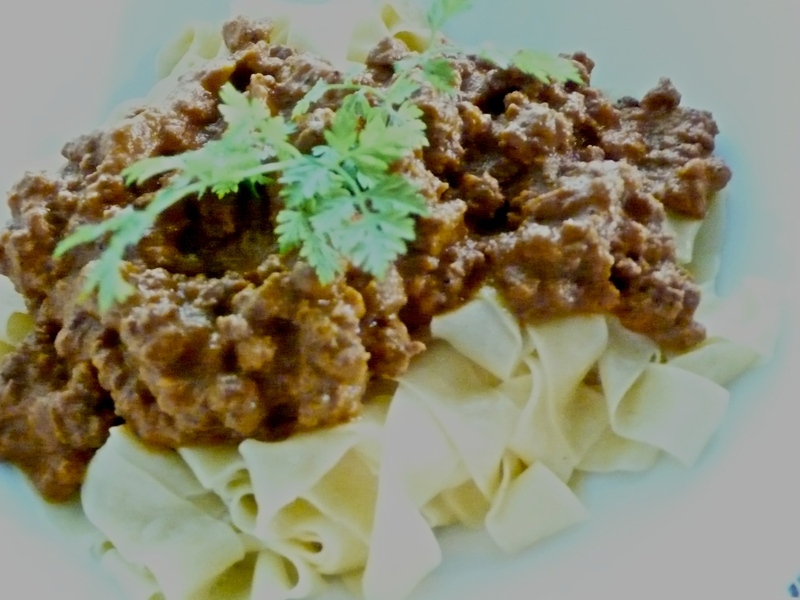 and had the bolognaise tagliatelle. It was a very large portion for a child’s size! 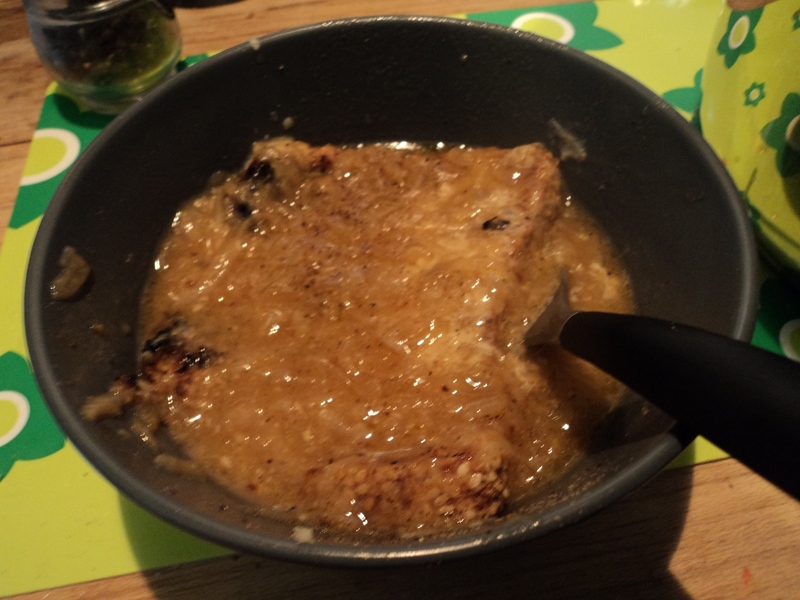 But she said it was really good – tomato-y but not too much so, meaty and flavourful without being too complex. Exactly what a child’s palate wants. She really wanted to try the chicken nuggets reimagined, but they did not have them, so we will have to go back again! 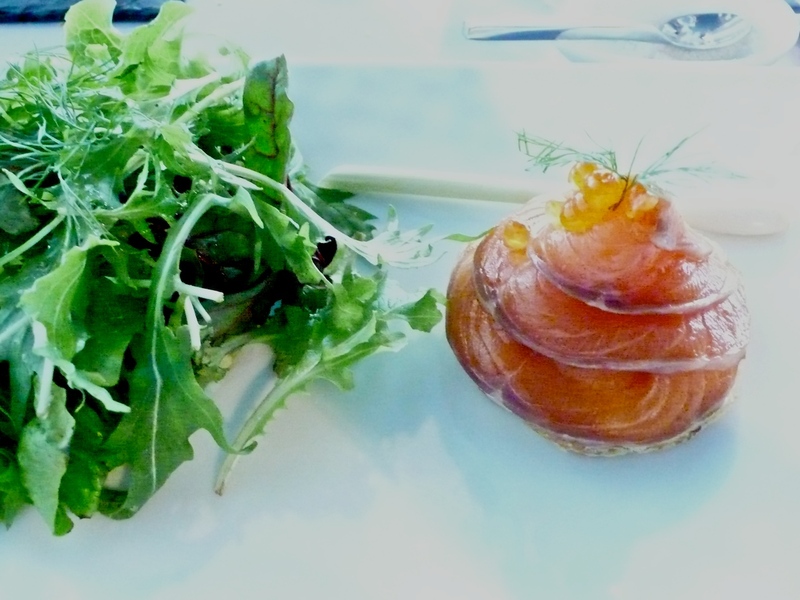 And finally there was another starter, salmon blini with lemon grass cream and a salad. Beautiful, simple, light – the lemongrass cream was sparkling – such a taste sensation with the silky unctuous salmon! Stunning presentation too. And then… came dessert! AngelKitten and I had done what we always do – check out the dessert menu first, and then thought about the main course! 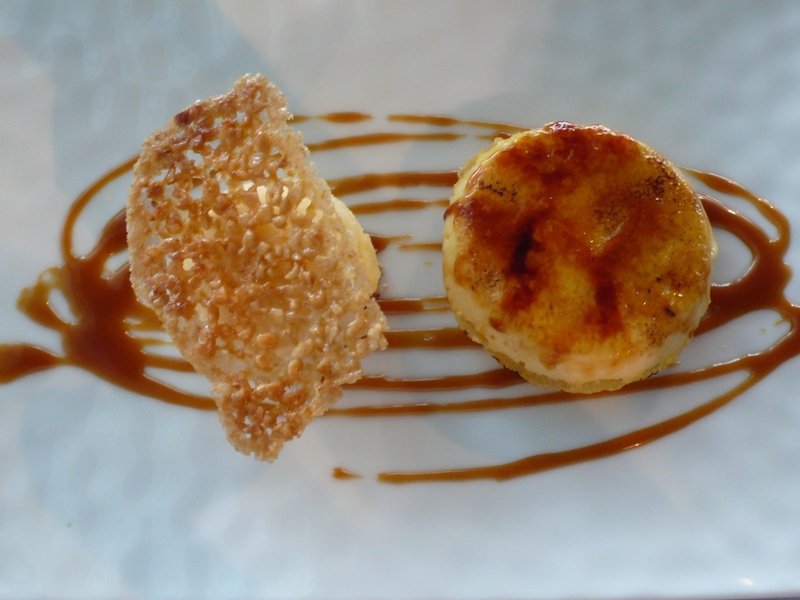 She had an utterly superb orange creme brulee with caramel sauce, and a blood orange sorbet. Such lovely contrasts – the icey cool sharpness of the sorbet – light and airy – sweet yet tangy – and the creamy sweet meltingness of the creme brulee. The whole plate was so well thought out. Everything complemented and contrasted in interesting ways. A delightful crunchy tuile sat atop the sorbet, sharp and crackly and sweet, light and icy and tangy. 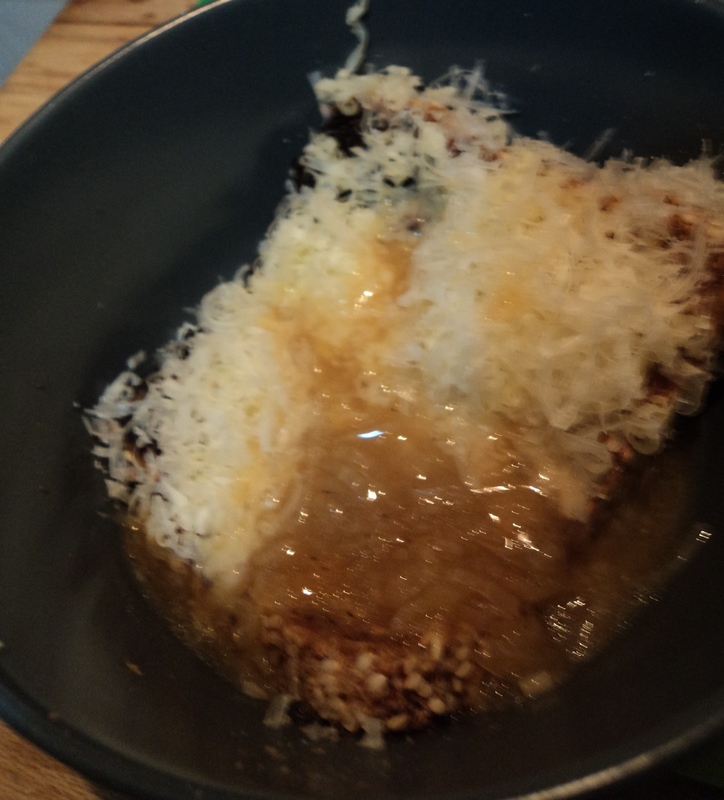 The creme brulee sat on a vanilla cookie crust – the texture of the crust the perfect balance to the richness and wobbly delights of the creme. So very very very good, and so satisfying. 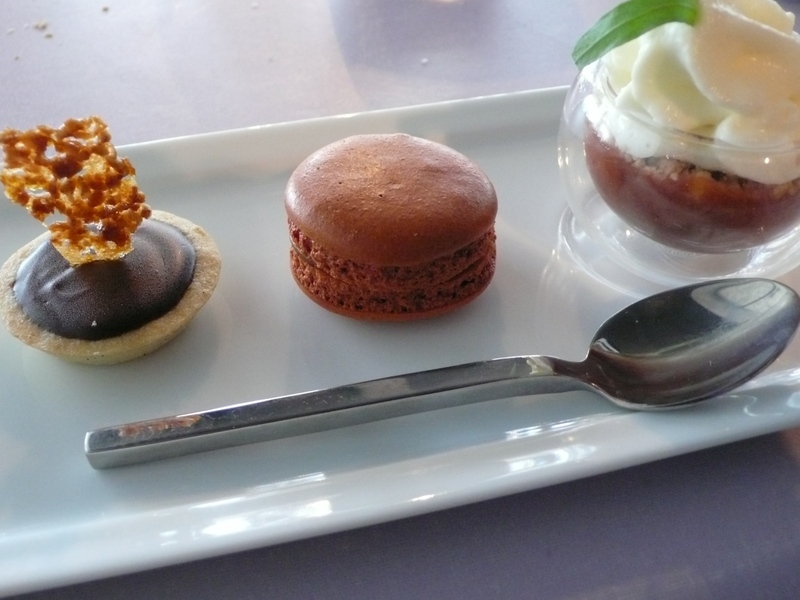 I had the trio of desserts – a consideration of how different chocolate can be! First there was a rhubarb and tarragon crumble with a white chocolate espuma. The rhubarb crumble was tart and soursweet, the crumble with hints of cinnamon. The chocolate here only highlighted the different taste sensations of the fruit, and was definitely a supporting character. Then there was a macaron – I chose the caramel, though I should have probably chosen the chocolate for unity of plate! I didnt regret it though – the caramel macaron was astonishing – a delight, a whisper of macaron, and a bold flavourful bittersweetsalty caramel licked in the centre. I could bathe in that caramel and be happy. And finally, a tiny, delicate chocolate tart, with a fragile vanilla crust. But it had a huge chocolate flavour – intense dark smoky notes. Wonderful. All in all a brilliant meal. As a cook, it inspired me to think of different balances and ways to present food. As an eater, it appealed to the sensualist in me. Was there anywhere we could find fault in this lovely new restaurant? Well, yes actually. The only uncomfortable note of the entire meal was the seating – outside seats were very low, and we could not sit there because of the noise and pollution from the construction. Inside was beautiful, but they had inexplicably chosen high, sharp bar seats and high tables. Very uncomfortable and difficult to get in and out of. The seats were the only thing in the restaurant that did not encourage you to stay a while and enjoy. Honestly, after an hour or so of sitting, they were painful. Nathalie’s Gourmet Studio changes its menu every month, so we will definitely be back next month to try more mouthwatering delicacies. It is exciting and very happy making to see such a high level gourmet space opening up in KL. Its wonderful to be able to explore the food mind of a serious chef through her menu. Thank you Nathalie for creating such a sumptuous gourmet experience! PS – Try the macarons! We brought back a large box – couldnt resist! The original recipe is in “Mastering the Art of French Cooking” – and I think it’s volume 1. It’s a one-pot method of turning your beautiful raw vegetables, which might otherwise become cloudy and dull in the fridge as you wait for another idea/opportunity to do something with them, into delectable little appetisers or salady thingies. You can do it with any vegetable that has firm texture and flavour, as long as it does not need to be cooked before being eaten raw like potatoes and aubergines do. I find it a much more forgiving method than oven-roasting or grilling for cold salad veg. I have used: courgettes, mushrooms, asparagus, pepper, celery, green beans, beetroot. Must do firm small tomatoes next. Take your fresh and good vegetables and prepare them as if for salad – cut them cleanly and decoratively and uniformly. Take a pot and put in it a scanty pint of water, the juices of one or two lemons, a cup of good olive oil, good salt, pepper, and garlic cloves finely chopped. Add any good herbs that you have to flavour your court-bouillon; bay, parsley, thyme, tarragon, fennel … I have added lemon rind too. Bring to the boil and simmer your vegetables within until tender but still holding their firmness. Mushrooms will be tender in 5 minutes or less (depending on your slicing of them); celery could take 20. Remove your vegetables, and leave to cool on a plate. Strain the court-bouillon and put it back to reduce by at least half. It will become a lovely flavoured smooth light emulsion. Then cool it down and bathe your vegetables with it. And then eat as they are at room-temperature or cold from the fridge later. And consider dressing them further by adding garlic or fresh herbs or more garlic or more whatever to them.